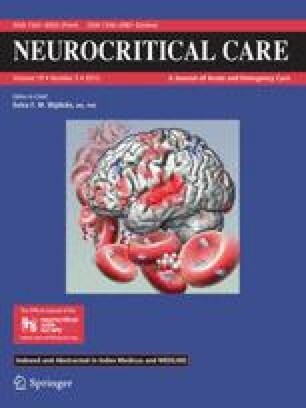 Although intracerebral hemorrhage (ICH) is a common form of cerebrovascular disease, little is known about factors leading to neurological deterioration occurring beyond 48 h after hematoma formation. The purpose of this study was to characterize the incidence, consequences, and associative factors of late neurological deterioration (LND) in patients with spontaneous ICH. Using the Duke University Hospital Neuroscience Intensive Care Unit database from July 2007 to June 2012, a cohort of 149 consecutive patients with spontaneous supratentorial ICH met criteria for analysis. LND was defined as a decrease of two or more points in Glasgow Coma Scale score or death during the period from 48 h to 1 week after ICH symptom onset. Unfavorable outcome was defined as a modified Rankin Scale score of >2 at discharge. Forty-three subjects (28.9 %) developed LND. Logistic regression models revealed hematoma volume (OR = 1.017, 95 % CI 1.003–1.032, p = 0.019), intraventricular hemorrhage (OR = 2.519, 95 % CI 1.142–5.554, p = 0.022) and serum glucose on admission (OR = 2.614, 95 % CI 1.146–5.965, p = 0.022) as independent predictors of LND. After adjusting for ICH score, LND was independently associated with unfavorable outcome (OR = 4.000, 95 % CI 1.280–12.500, p = 0.017). In 65 subjects with follow-up computed tomography images, an increase in midline shift, as a surrogate for cerebral edema, was independently associated with LND (OR = 3.822, 95 % CI 1.157–12.622, p = 0.028). LND is a common phenomenon in patients with ICH; further, LND appears to affect outcome. Independent predictors of LND include hematoma volume, intraventricular hemorrhage, and blood glucose on admission. Progression of perihematomal edema may be one mechanism for LND. Funding for this study was provided by NIH D43-TW008308-01 (WS/DTL) and the American Heart Association—Scientist Development Grant (MLJ). All the authors are declare that they have no conflict of interest.